Fred. 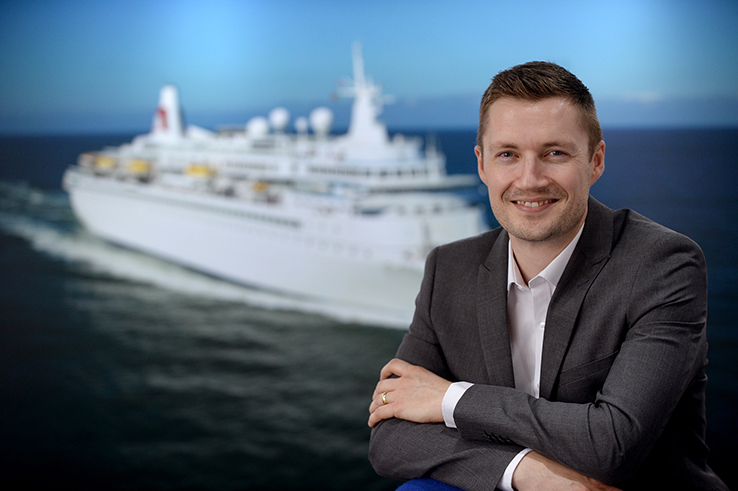 Olsen Cruise Line's Itinerary and Experience Development Manager, Martin Lister, has been planning and creating Fred's glorious cruise itineraries for over a decade. Here he tells us all about his cruising experiences since landing his dream job 11 years ago..
PC: How long have you been working at Fred. Olsen? ML: I’ve been working within the Fred. Olsen Group since 1999, starting in the Freight Division, exporting groupage to the Canary Islands. I then took a position in Quality Assurance, after assisting the department voluntarily as an Internal Auditor. I established a broad understanding of all areas of the business during my time within the department, before I moved to Itinerary Planning in 2005. I was fortunate enough to be promoted to my dream job and I’ve been planning Fred. Olsen Cruise Lines’ itineraries for the last 11 years. PC: What do you love most about your job? Creating new and exciting cruise products and also developing ways for our guests to experience the best of the destinations that we visit. PC: What is your favourite port and why? ML: It’s very difficult to choose one, because there are so many fabulous destinations around the world, but three of my favourites (if I’m allowed three!) are Seville (Spain), Longyearbyen (Spitsbergen) and Akureyri (Iceland). Seville, which can only be reached by smaller-sized cruise ships, like our Braemar, is a beautiful city, with stunning architecture and a relaxed and truly authentic Andalusian feel. Our guests benefit from the central docking location, with attractions such as Maria Luisa Park, Plaza de Espana and the UNESCO-listed trio of the Alcazar, Archive of the Indies and iconic Seville Cathedral. Secondly, I simply love Longyearbyen’s breathtaking mountains and glacier scenery, which surround this remote, somewhat eerie former mining town. PC: What makes a Fred. Olsen itinerary stand out from the rest? ML: We are experience-led, meaning that we identify the experiences that we believe will appeal to our guests, and offer them ‘memories that last a lifetime’. We take time to select the destinations and hand-craft the itinerary, in a way that offers guests the best opportunities to make the most of their holiday experience and see the world in a very different way. PC: If any, do you have a particular cruise itinerary you’d love to go on that you haven’t yet? ML: I would actually love to go on an Azores cruise. My wife, daughter and I are all ‘wowed’ by mountains and beautiful scenery, and the lush volcanic landscapes of the Azores look stunning! PC: What is your favourite excursion and why? Whale-watching in Akureyri, Iceland. The chance to go and witness these giants in their natural environment is breathtaking and something you just do not see every day. PC: How far in advance do you have to start planning itineraries? You can never be too far in advance and I’ve always got one eye on the distant future; but, generally, planning begins two years in advance. PC: How is it decided which ship sails where? ML: Our cruise ships do not concentrate on a particular region, and each offers a very varied programme, so you can expect to see a selection of cruises to the Arctic, Mediterranean, Norwegian Fjords, Baltic and further afield on any of our ships. However, the location of the departure port plays an important part, as does the size of the ship, allowing us to cruise the more restricted areas, such as tidal rivers and tight ports and fjords. PC: What do try to include when planning an itinerary? ML: Our itineraries are well-balanced and, ideally, contain the following key elements: time ashore in port; stunning scenic cruising; the ‘added value’ of a special event; and time at sea, in order to be able to experience the fantastic service on board. PC: If you are a first time cruiser what itinerary should you start with? ML: The Norwegian Fjords. We use our long-standing Norwegian heritage and the experience of Norwegian Intercoastal Pilots to divert away from the regular routes used by larger ships; instead, we choose to navigate into narrower, size-restricted fjords, which bring something unique to the itinerary, showcasing what this stunning country is all about. We know the real appeal is the spectacular scenery – after all, it’s a Norwegian ‘Fjords’ cruise, not a Norwegian ‘ports’ cruise! PC: Can you recommend an itinerary for people with limited mobility? ML: We aim to use our smaller-sized ships to dock closer in the destinations compared to where the larger ships have to berth, meaning that the walking distance from the Fred. Olsen ship to the main attractions is much less. We have certain cruises with the entire itinerary featuring these closer ports – such as Braemar’s 16-night Mediterranean & Provence cruise, and Braemar’s 14-night Baltic sailing. PC: If you were a single cruiser, which itinerary would you recommend? ML: Braemar’s 10-night Welcome to Denmark cruise in May 2018 is probably the ‘happiest cruise in the world’, because it visits one of the ‘happiest’ countries in the world! Here, guests can expect to be greeted with a wonderful warm welcome by friendly locals in traditional dress, witness Viking battles and even feast on free Danish hotdogs on the quayside! PC: Do you have any top tips for our customers on a cruise with Fred. Olsen? Take time to think about what you want from your Fred. Olsen holiday – we know that there is a cruise out there for everyone! For a cultural sailing consider Braemar’s 23-night Adriatic cruise from Southampton in October 2018; or if a shorter, ‘taster’ break is more your kind of experience, try Balmoral’s five-night Norwegian Fjords from Newcastle in August 2018. For a taste of the exotic, Fred. Olsen’s new holidays to the Indian Ocean, such as Boudicca’s 14-night Indian Oceans & Zanzibar fly-cruise in December 2018. Remember that a Fred. Olsen cruise does not necessarily mean having to dress up ‘formally’ every evening. Whilst the ‘Formal’ Black Tie evenings are a big part of the Fred. Olsen experience, guests can still dine informally in the buffet restaurant, and they do not have to dress up if they do not wish to.